You only need a few things for content delivery with SCHEMA: SCHEMA ST4, SCHEMA CDS, modular content and metadata. To tell you the truth, SCHEMA ST4 is not absolutely necessary here, but that’s a discussion for another time. For a long time now, SCHEMA ST4 has been your tool for creating intelligent modular content with taxonomies and metadata. One upload to the Content Delivery Server later and your content is also available via mobile apps or the browser, where it can be filtered according to target group. 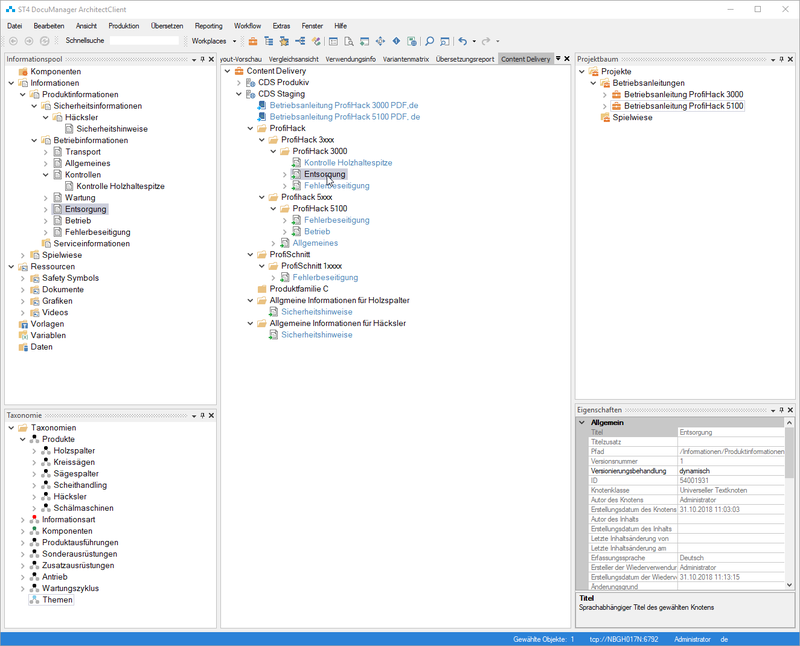 There are now some new features awaiting you in SCHEMA ST4 and SCHEMA CDS which make this process even smoother. To enable quicker assignment of metadata to large amounts of content, we have developed the new Content Delivery Viewlet for SCHEMA ST4, which is used to assign hierarchical metadata to folders. If you reuse modular content in these folders, the content inherits the metadata in the folder. The folders in the Viewlet can also be nested within one another. Once content is reused in a subfolder, the content inherits all metadata of the subfolder and all superordinate folders. Content can also be reused in several folders or subfolders, making numerous assignments of increasingly complex metadata much easier. The Content Delivery Viewlet was intentionally developed as an alternative option for the classification of modules and will not replace the conventional method using the project tree. However, we are considering how content classified using the new viewlet can also be compiled into documents via the project configurator. Content classified using the Content Delivery Viewlet would then be used both for content delivery (e.g. also for print-on-demand) and conventional publications. In the same way as in SCHEMA ST4, we will also be promoting more straightforward handling of modular content in our Content Delivery Server. 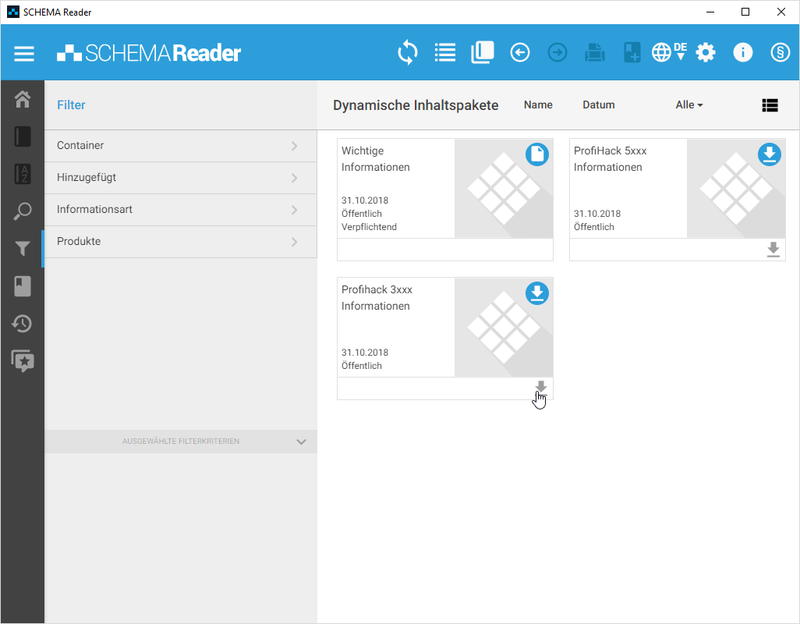 As of SCHEMA CDS Version 2018.9, there is a new filter for the SCHEMA Reader, which allows modules with independent content to be viewed in an optimised manner. What’s more, search requests and filters can be stored as dynamic content packages. As soon as new content is published on the SCHEMA CDS that matches this filter, it is automatically added. These collections can then be transferred to mobile devices and used offline. If a collection contains new information or information is omitted from a collection, these changes are synchronised to mobile devices. How does this make content delivery easier? Many companies are currently striving for different content delivery scenarios, be it for access via an app/browser, augmented reality (AR), Industry 4.0 and much more besides. The pooled knowledge in the technical writing department should be shared digitally and made available anywhere, anytime. Intelligent content is the foundation for user-friendliness in all these scenarios. Users want to be able to filter precisely for content that they currently need: they want an answer as quickly as possible without additional work. Our new features make it even easier to manage and classify content of this type: you can classify content optimised for content delivery in the Content Delivery Viewlet more quickly and more easily, and you can find intelligent content more quickly in SCHEMA CDS using the new view and new collections. If you are planning to attend the tcworld conference in 2018, come and visit us on Stand 2/C07! We look forward to seeing you. I will also be holding a daily presentation for customers in our BlueBox, which will focus on these new features in SCHEMA ST4 and SCHEMA CDS. Jochen Marczinzik is a team leader at SCHEMA and product owner of the CDS. He has been active in the field of technical documentation for almost 20 years, of which more than 10 years were spent as a consultant and project manager.